Last week an artist I know was visiting from London. Whenever he sells a painting he gives away a percentage of the money in a manner that he calls ‘interventions’. As we sat talking in the artspace at 35 Chapel Walk he said “I’ve got £100 to give away tomorrow as an intervention, what should we do?”. And so we devised the Money Emporium. 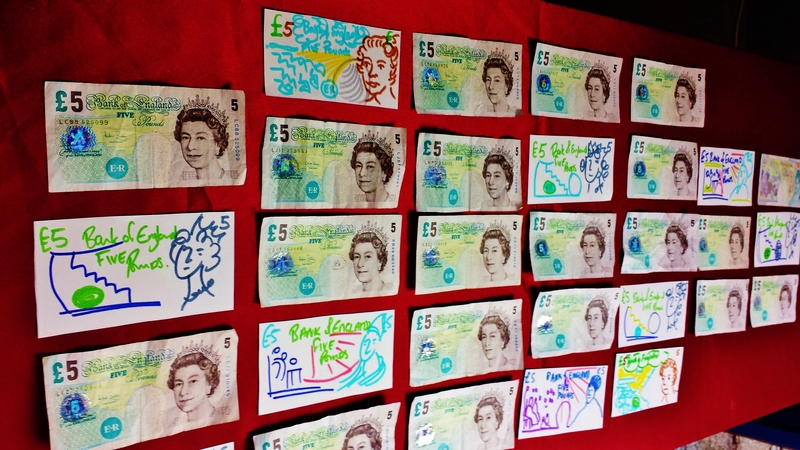 In the shop front of number 35 on a busy shopping street in the heart of Sheffield, we laid out a display of £5 notes along with notes we had drawn ourselves. We then invited passers by in to buy a £5 note for whatever they wanted to give us. As an artist who is used to working away in the solitude of my studio it was exhilarating for me to be a part of a creative intervention like that. The confusion on the faces of the people who came in as they tried to wrestle with the concept was a delight. Were we for real? Was it a con? Were the notes genuine? At times people seemed paralysed by the situation, not knowing what to do or how to behave. And then the only way to help them out of what seemed like a short circuit in their brain was to tell them “It’s art”. Once we’d defined what was happened, allowing them to put the experience in a box labelled ‘art’ they were able to move forward. I do wonder whether we gave people an easy way out by labelling the intervention as art, preventing them from deeply engaging with the how disorienting the situation was. Some people gave the impression that they felt they were getting one over on us by giving something that was clearly worth less than £5 whilst others wrestled with what to give us, concerned to ensure that they didn’t give us something too worthless. A lady, keen to give us not just any pen but her ‘favourite pen’, A man who wrote a haiku there and then, A girl who made a drawing but then hesitated because she didn’t think it was worth £5. But then what does “worth £5” even mean? 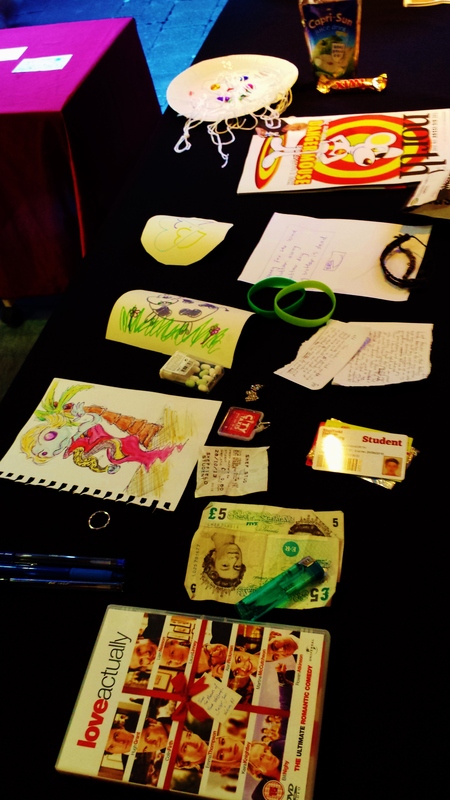 The more I freely gave the money away for whatever people wanted to give us then the more the value of money seemed to dissolve until it seemed to make no difference to me whether the piece of paper I gave them was a ‘real’ note or one of the notes that we had drawn ourselves. They were both pieces of paper with ink on, but somehow, our society agrees that one is “worth” £5 and the other isn’t. This seems to me to be an act of faith: if we all believe this piece of paper has value then it does. 35 Chapel Walk is open most weekdays and we have a good variety of exhbitions coming up. 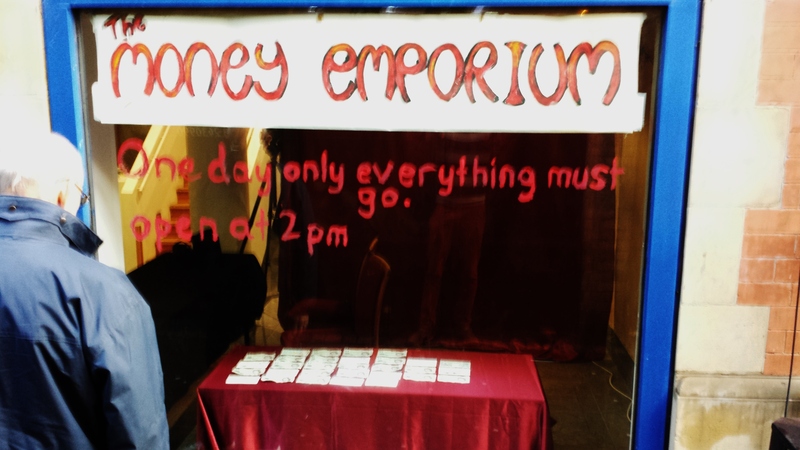 The Money Emporium was a one off event. I love the sound of this – I work with intervention art too – and lifelike art (ref. Allan Kaprow). It also reminded me of a day many years ago when I took my young daughters with me to visit a friend of mine who lived in a bender (makeshift home) in a wood. While we were with him he was discussing the meaninglessness of money – his aim in life was to live without it – he proceeded to burn a £5 note on his fire. My daughters, now grown women, have never forgotten it.